I know, the cuffs aren't buttoned. and let me take a picture. 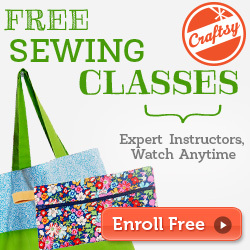 Some women are afraid to sew for boys and men. There aren't very many patterns, but if you stop and think; the stores don't have many variations. Men and boys wear pretty much the same things once they stop wearing diapers. The only difference is material, pattern and a few minor changes here and there. When Middle Son told me that I needed to sew him a dress shirt, I was overjoyed. This kid doesn't ask for much. So, I didn't get on his case for telling instead of asking like the Mom Rule Book says I should. 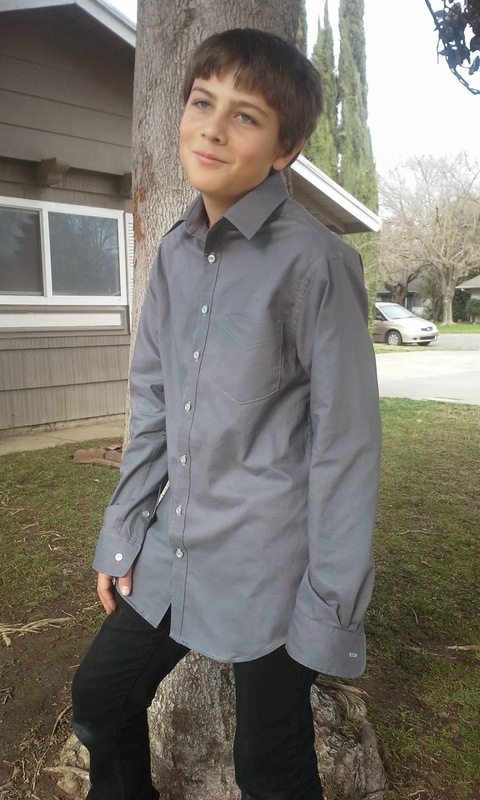 So I decided to show him the Sis Boom Ethan Button Down Shirt for Boys. This is the second of two posts for this shirt. The first post describes the process up to here. wrong side of the sleeve. Now a dress shirt just looks hard. It is full of little details that look amazing and mystifying. The sleeve placket is one of them. 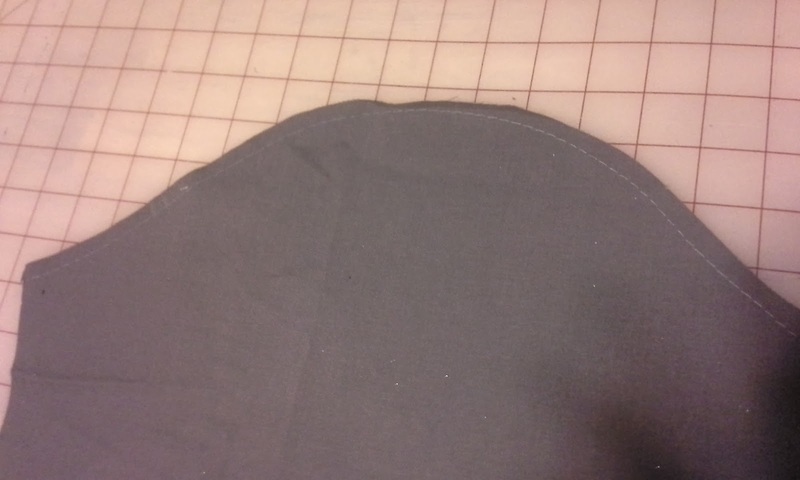 It starts off looking like a little house with a chimney and becomes...a sleeve placket. It is like fabric origami. I followed the instructions because the placket looked smaller than what I'm used to and I'm glad I did. This has about 1/4 inch turned on all of the perimeter, except the sleeve edge. They suggest using a glue stick, but my Kona Cotton presses so well, it wasn't necessary. The trick is to have the wrong side up for both the sleeve and the placket. The chimney side is toward the center of the sleeve and the shorter side toward the edge. There are notches, but I need this visual or I have a mess. It's starting to look like a placket! This pattern has you sew straight from the edge all the way through to the turned edge at the top. There are two lines to stitch. Then, you cut all the way through to the edge right between the two lines of stitches. From there, it is fold here, fold there, turn everything to the other side, realign and voila...a sleeve placket, ready to stitch in place! Wow! Sewing magic. and ready to stitch in place. It is now stitched an is ready for a cuff--but not yet. The worst part to me is putting in sleeves, but it isn't really very difficult if done with patience. I have a couple of methods, but this is just one variation. I don't know what the method is called, but I don't it creates a flat felled seam. It was inspired by David Coffin's book Shirtmaking Techniques . This is also where I picked up most of my techniques for sewing shirts. I start of by using a long stitch, 6 mm on my machine, and I stitch about the width of my pressure foot. 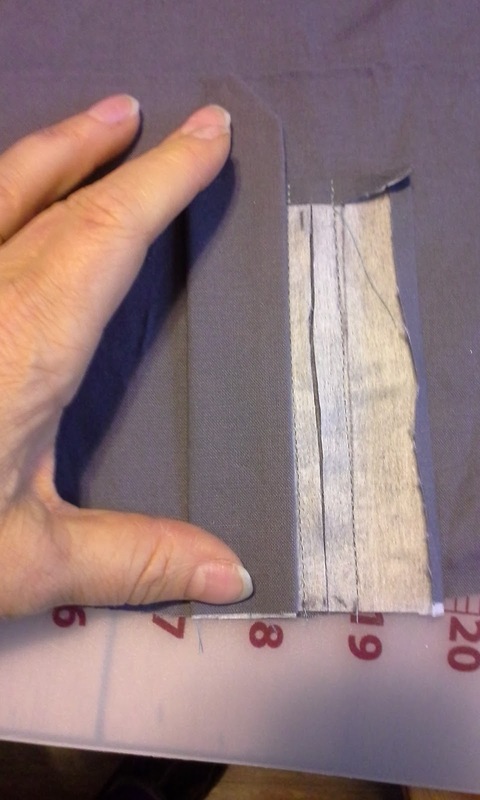 I then use this as a guide to press the top of the sleeve toward the right side. 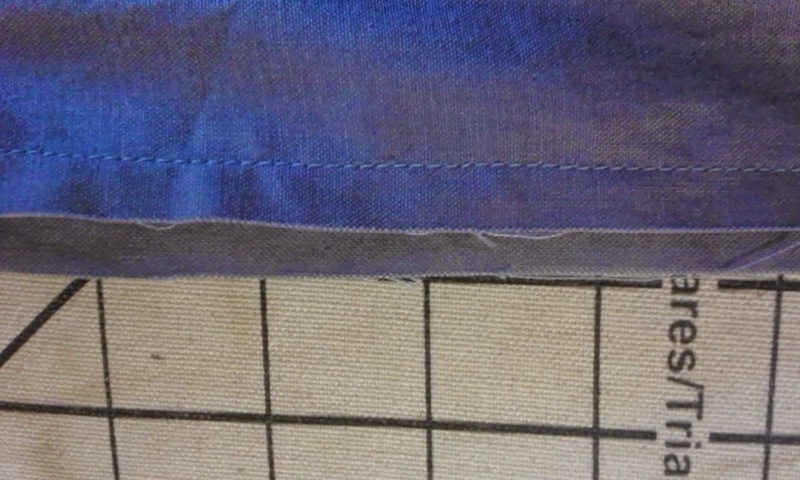 A 6mm stitch is used as a guideline for pressing. I use the presser foot to guide my line. Once it has the edge pressed, I can start lining up to pin in place and then stitch. But do not line it up evenly. The turned edge is off set so that it is about 1/8" in from the raw edge of the arm sync/back-front-yoke edge. I then use my presser foot to guide me from the raw edge. I wish I had pictures. I was in my sewing zone and just sewing along. Good thing the house didn't catch fire, I might not have even noticed once in the zone. When done correctly, and I often don't do it right the first time, when you turn it to the right side, it will be a perfectly sewn seam. If not, you will see the raw edges of the turned side. That is seam ripper time. 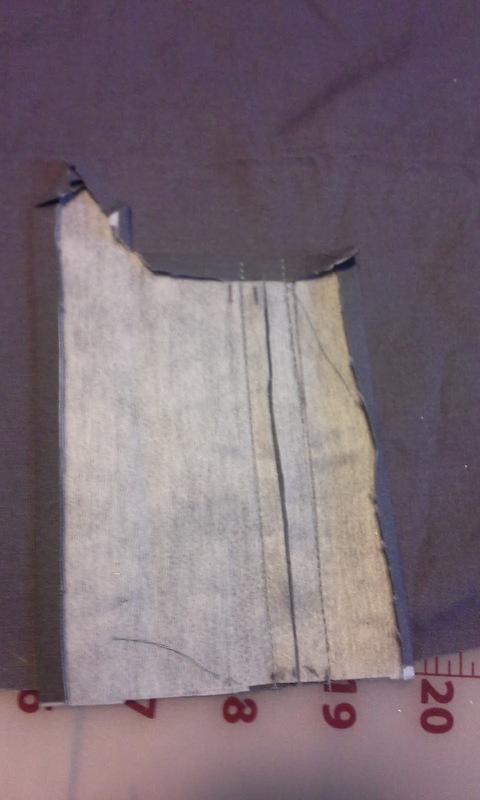 Now if done correctly, you now have your turned edge for the flat-felled seam at the body/sleeve seam. 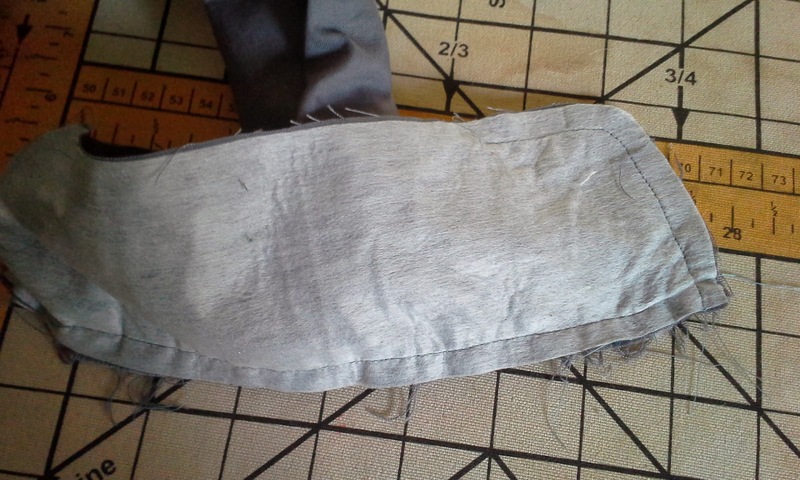 Now just press for good luck, then sew the edge down and you have a pretty flat-felled seam. 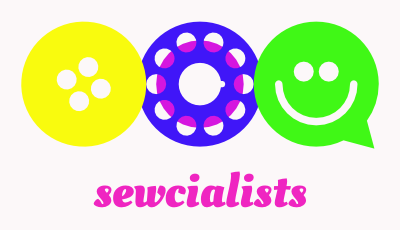 Now, Peter over on Male Pattern Boldness asked his readers if they sew for professional standards or good enough. Well some things are just good enough. This shirt did not leave a beautiful inside seam--it is just good enough. The outside, is pretty darn good. I did redo it, but that zone thing just kept taking over so there are not pictures. On to the side seam. 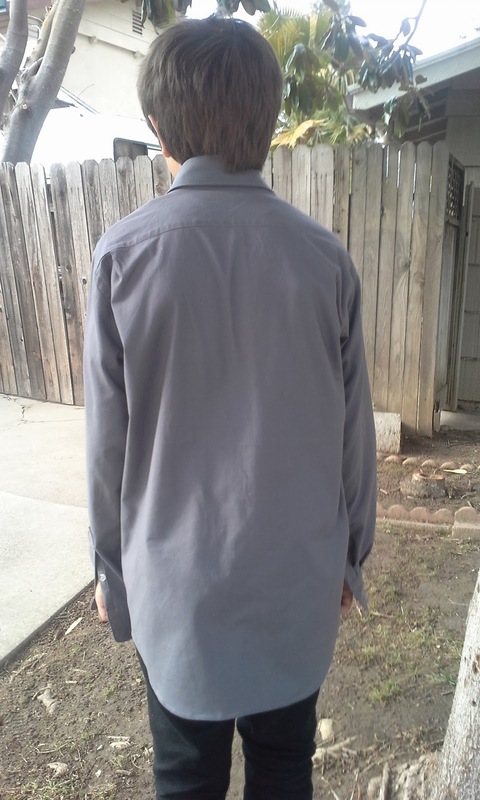 The side seam of a men's or boy's dress shirt is a flat-felled. I have a couple sizes of flat-felled presser feet that fit my machine, but I usually just do it my way. 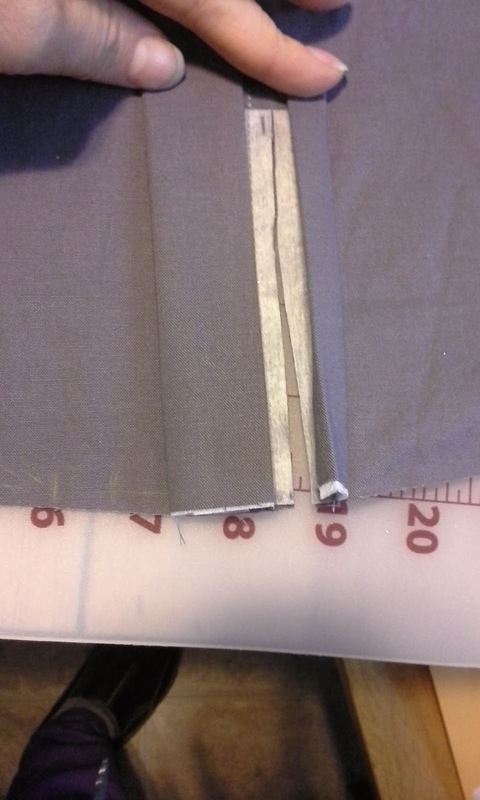 Off setting the edges makes for easy flat-felled seams. I think the camera angle created an illusion. 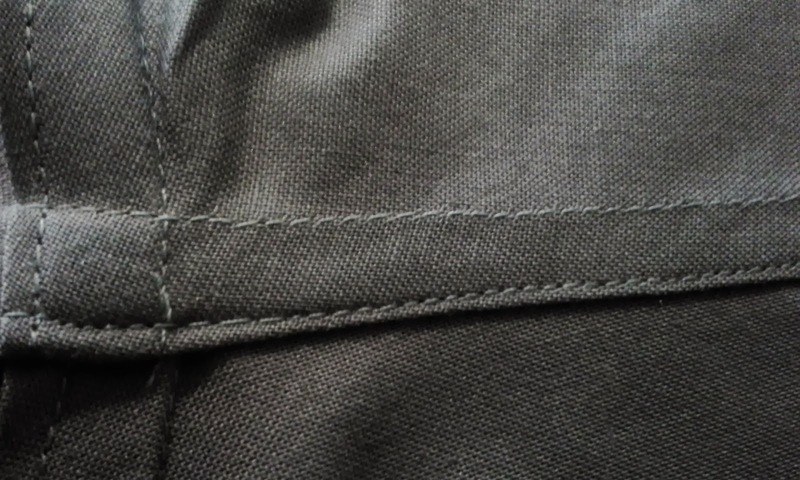 By lining up the side seams from the hem through the sleeve to the end of the cuff-less sleeve, it is a nice smooth seam. I offset by about a quarter of an inch by laying the back down first and the front in a 1/4 of an inch, right sides together. I then pin and stitch. Then, off to the ironing board to press the seam flat. After pressing, turn the offset edge over and press. 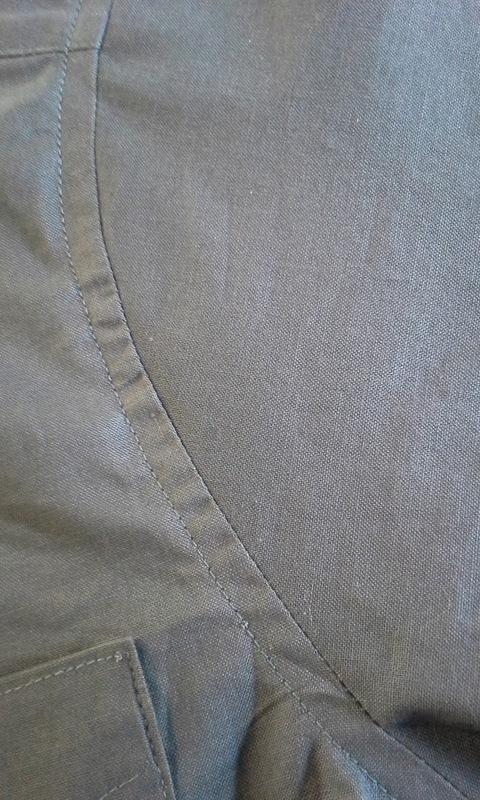 It should wrap around the shorter edge, but not over the seam stitches. 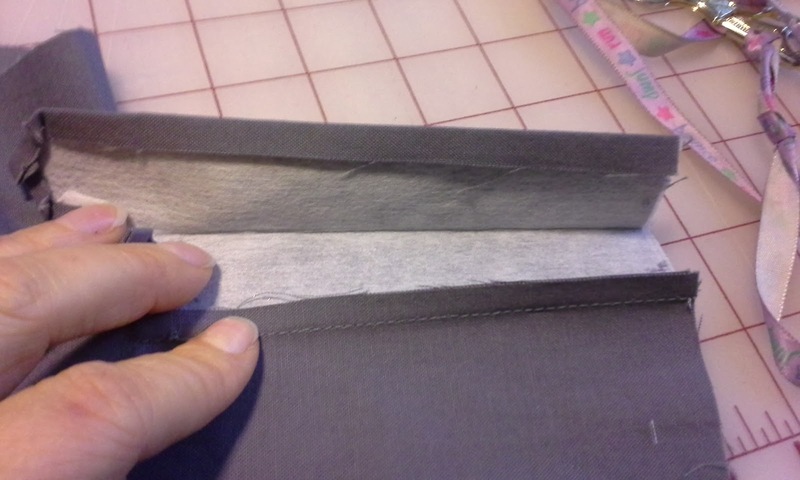 I then pull out the sleeve board and open the seam so that I can press it flat with the edge inside and press flat. I then stitch from one end to the other. It gets tricky inside the sleeve, but just take it slow. Sometimes I only go an inch or so before re-positioning. Inside the cuff before turning. Once the side seam is done, I usually do the hem. It makes me feel like I'm almost done. I finished the collar and collar band pretty easily. I again used the techniques inspired by David Coffin and his book, Shirtmaking Techniques. They went together very smoothly, as did the cuffs and the first try at the buttonholes. 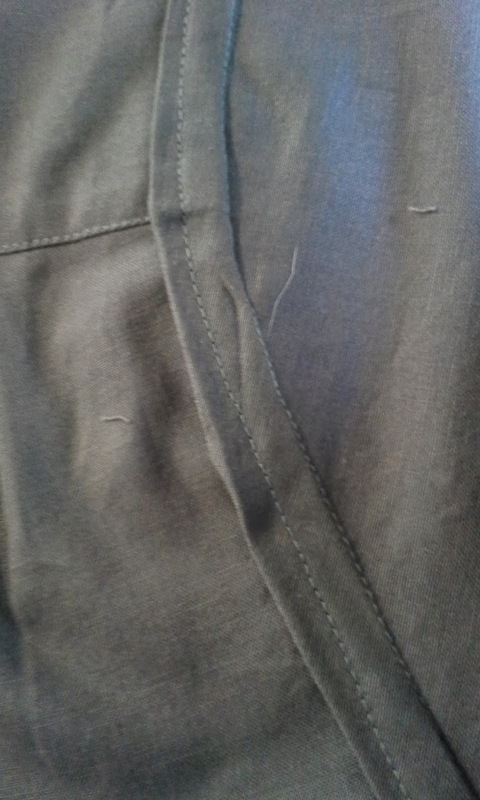 The Ethan shirt has a buttonhole guide for both the front and the cuffs. 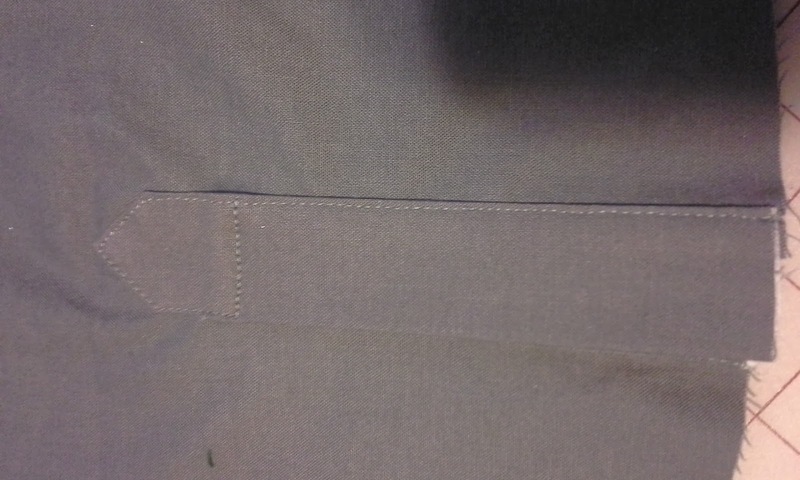 The cuffs and the placket buttonholes went smoothly. so did the front. Until I realized I put them on the wrong side. Luckily, I hadn't cut them yet and was able to remove them. I finished sewing my last remade buttonhole just as the last tail of thread came off out of he needle of my machine. I guess I was done. The last two buttons went on with a slightly darker shade of grey. My little boy is now ready for his Swing Dance Competition tomorrow! I had to bribe him to either give me a picture or let me go to his competition. He finally let me take his picture. very nice shirt! And all your tips and photos are great! I haven't made a button up shirt in years but it's on my 2014 to -do list and I appreciate your tips!